Lots of people want what Glowforge is producing. Glowforge co-founders Mark Gosselin, Dan Shapiro, and Tony Wright. Photo via Glowforge. The Seattle startup today announced that it recently reached $45 million in sales for its innovative 3D laser printer — even before it has shipped a single product to a non-beta customer. Glowforge set a crowdfunding record last year by raising nearly $28 million from thousands of backers who pre-ordered its 3D laser printer this past October. It has continued taking orders at a special discounted price of $2,395 for the basic model. The company is not announcing total number of units sold to date, but with the $45 million mark at an average of $3,595 for each order — there are three options that range from $2,395 to $4,795 — that’s about 12,500 printers. Glowforge, which last month raised a $22 million funding round, has delayed shipments of initial orders twice. The company’s original plan was to start shipping the “first units” in December, two months after the crowdfunding campaign ended. But in February, Glowforge said those shipments were delayed, telling the initial backers who pre-ordered during the 30-day campaign that they’d now receive their printers in June. At last year’s GeekWire Summit, Glowforge CEO Dan Shapiro showed off a bag he made with the Glowforge 3D laser printer. Then, this past April, Glowforge again delayed shipments due to power supply issues and pushed the delivery date back to December 2016. The company is still on pace for the December ship date; all orders placed after the 30-day crowdfunding campaign will ship in March 2017. 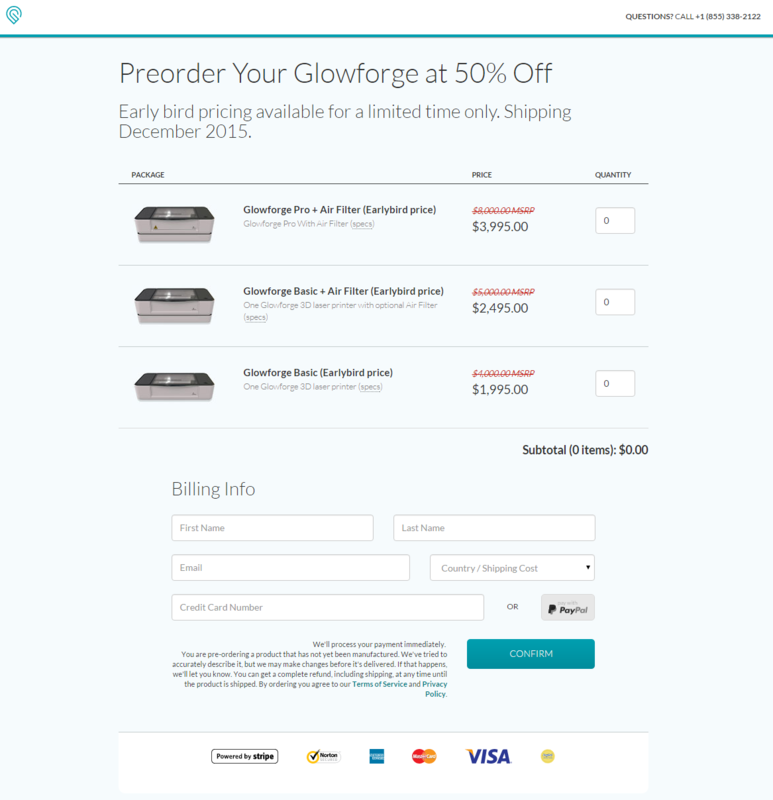 Glowforge, which is offering full refunds to those who want to back out of their pre-order, is now delivering beta units and will end its pre-order promotion at the $2,395 price point on Sept. 30. The printer normally retails for $4,000. “While we still have design adjustments going on, they’re increasingly minor,” he wrote. Glowforge was founded in 2014 by Shapiro, who created the popular kids board game Robot Turtles — one of Kickstarter’s most successful campaigns ever — and fellow Seattle area startup veterans Tony Wright and Mark Gosselin. The company employs 36 people, up from 14 this past December, and has job openings for another 18 positions. Total funding to date is $31 million.